I’ve always been a fan of gifts that actually involve some time & effort on the giver’s part: homemade crafts, some personalized poetry, a collection of photographs that will have great meaning, etc, etc. Not that I don’t like store-bought things! I love participating in both types of retail therapy (buying for others and receiving for myself) and get the same rush as anyone else when gifted with something really spectacular (like the gorgeous new designer purse my Aunt got me; Holy Hannah! I was NOT expecting that!). But I still like giving a little something that came from my heart rather than the mall. Making your own gifts really helps to cut down on costs, too. I’m sure a lot of you have been hearing the media coverage on this year’s slow economy and its effects on the whole Christmas shopping show, and one thing I saw on a few different newscasts was that many folks are spending more at their local grocery stores than at department stores. Why? They realize the value of rolling up one’s sleeves and baking a couple of batches of sweet treats for their friends & loved ones. Not only does it cost much less than most department store gifts, it’s something the receiver can truly appreciate as something that took a little extra thought & effort. Not once have I seen a face that doesn’t light up at the sight of baked goodies, especially once they hear that they’re homemade. So here’s my attempt at creating something different when I bake, which means: something that doesn’t involve chocolate. As a card-carrying chocoholic I adore all my chocolate confections, but I didn’t really have any chocolate to bake with and couldn’t really afford to get some. I considered making some of my mom’s pecan sandies but couldn’t really afford the pecans, either. Finally, I decided to make something up that involved a couple of mandarins and the remaining dried cranberries I had in my cupboard. I love the taste & aroma that fresh citrus rind can add to any recipe and thought it would be fun to use some of the mandarin rind in my dough, as well as a tiny amount of fresh mandarin juice. 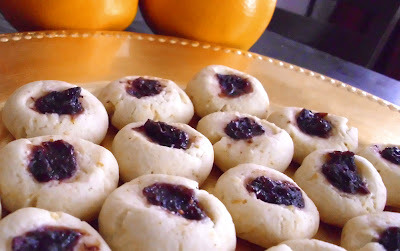 Since I didn’t have any jam or cranberry sauce for the thumbprint cookies I had in mind, I made my own “jam” by soaking the dried cranberries in fresh mandarin juice and pureeing them once they’d plumped up. The result was a deliciously sweet-tart jam delicately scented with sweet mandarins. Though I’m more of a cook than a baker, I’m still pretty pleased with how these little cookies turned out. They’re not too sweet and the tartness of the jam lends an extra zip that’s played up wonderfully by the mandarin rind in the actual cookies. Their small size makes them easy to share and a little less guilt-ridden than some of the more sinful treats out there. But my favorite part is how these cookies just came to be. By staying creative and upping my resourcefulness to combat my lack of jam, I was able to create something out of almost nothing, which is something I try to hammer home as much as possible on ye olde blog. When you have very little cash and no credit at your disposal, and you only have a few ingredients in your kitchen, try not to freak out. Take a moment to breathe & regroup and put on your thinking cap (or go to the Recipes tab at the top of the page, lol); you’d be surprised at the new & interesting combos you can create yourself. Trust me; this is exactly what I do most of the time and so far I’ve been very pleased with the results! It really does help to take away from some of the stress of being so broke to know that a small amount something can go a long way – sometimes far enough to provide some delicious, low cost gifts for your loved ones. Soak the dried cranberries in the mandarin juice until plump (4 hours or so) and puree until smooth. If too liquid, simply place the puree into a fine mesh strainer and allow some of the liquid to drain off until you’re left with a thicker jam. Place in a bowl and set aside. Grate the mandarins and place the zest on a plate with plenty of paper towels and blot gently to absorb some of the extra oils. This will make the zest easier to work with as it will not clump together. Whisk together the flour, baking powder and salt in a large bowl. In a separate bowl cream together the butter and sugar with an electric mixer until creamy & fluffy. Add the egg and mandarin juice and beat into the butter & sugar mixture. Slowly, with the mixer on its lowest speed, add the flour mixture about ½ cupful at a time. Mix until completely combined. Shape the dough into a large, flattened disk, wrap in plastic wrap and refrigerate for about 1 hour. Preheat the oven to 325° and prepare the baking sheets with parchment paper. Remove the dough from the refrigerator and let stand for about 5 minutes before shaping into 1” balls. Take each ball and make a slight indentation with your finger and fill with about ¼- ½ teaspoon of cranberry jam and place on the parchment lined baking sheet. Bake for 18-20 minutes or until lightly golden on the bottom. These cookies are supposed to be soft and have a naturally pale color so make sure not to overbake. Cool on cookie racks for about 10 minutes and enjoy! I got this recipe mid-day and was going to the store to get a few last things for Christmas Day, so I grabbed some cranberries and my daughter and I went to work making these while the lasagna baked for dinner. These are TO DIE FOR! They are so easy and they come out light blonde in color. A girlfriend popped in and I put some in a plastic tub to take for tomorrow morning with coffee. We are on our second batch baking right now. Thanks for a really inexpensive and easy treat! 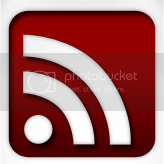 Hi Kimberly, love the blog! In this recipe, you say whisk the dry ingredients including sugar. Then you state "cream together the butter and sugar"... Should I assume that all the sugar is creamed with the butter and none is actually mixed with the flour and salt and baking powder?